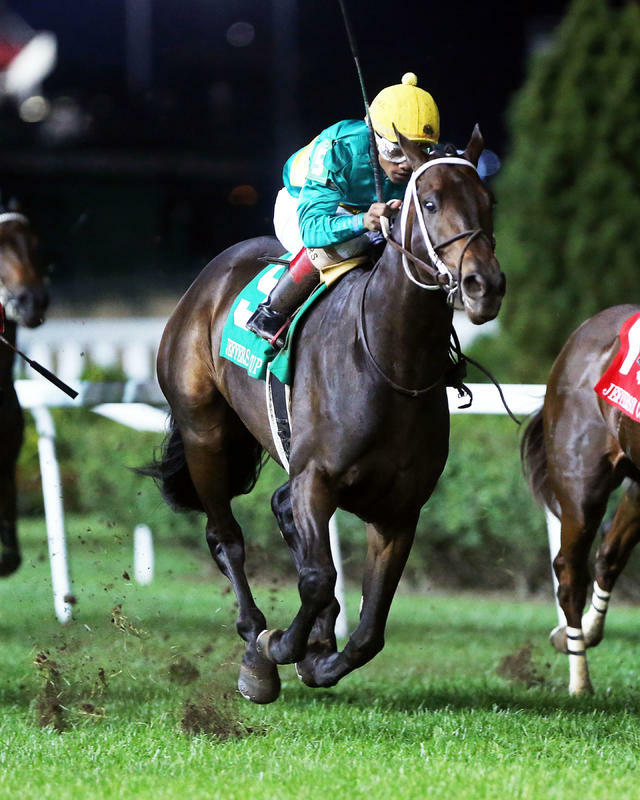 Hot Springs collected his first stakes victory and third win in as many starts at Churchill Downs when he spurted clear inside the final sixteenth of a mile to win the 42nd running of the $100,000 Jefferson Cup (Listed) for 3-year-olds on Saturday night at Churchill Downs. Ridden by Ricardo Santana Jr. and trained by Steve Asmussen, Hot Springs had a perfect inside tracking trip behind the early leaders before he swung out at the top of the stretch to collar longshot pacesetter Discovered in deep stretch to win by one length. Captivating Moon was another head back in third. Hot Springs clocked 1 1/8 miles on the “good” Matt Winn Turf Course in 1:54.18 – the slowest of 28 renewals over the distance and surface – and won for the third time in six career starts for Bill Farish Jr.’s Woodford Racing LLC. The $59,520 winner’s share jumped the Uncle Mo colt’s earnings to $187,720. Previously, the Kentucky-bred finished fourth in last month’s $300,000 Saranac (GIII) at Saratoga and was second in the $200,000 Kent (GIII) at Delaware Park in July. He paid $6.60, $4 and $3 as the 2-1 betting choice in the field of nine. Morning line favorite Majestic Eagle was scratched early in the evening. For Asmussen, it was his second Jefferson Cup victory after taking the 2007 renewal with Inca King. The Jefferson Cup is named in honor of Jefferson County, the most populous county in Kentucky which Churchill Downs resides.